In Turkish the name literally means Cotton Castle and it is easy to see why it was given that. 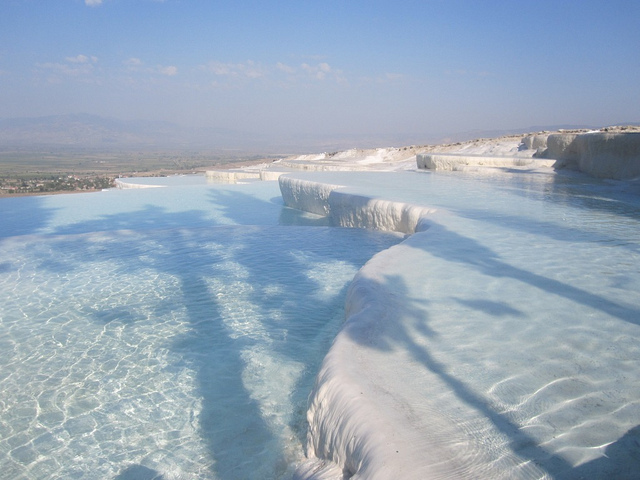 Yet this geological wonder is also the site of the ancient city of Hierapolis and over the centuries the two have seemed to come together, merged almost, in to one. In fact some of the old tombs in the city's necropolis have beome part of landscape - literally. 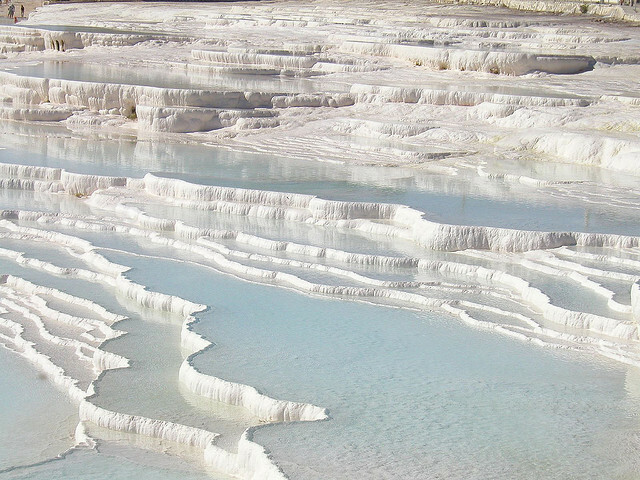 The site itself is a series of travertines and hot springs. 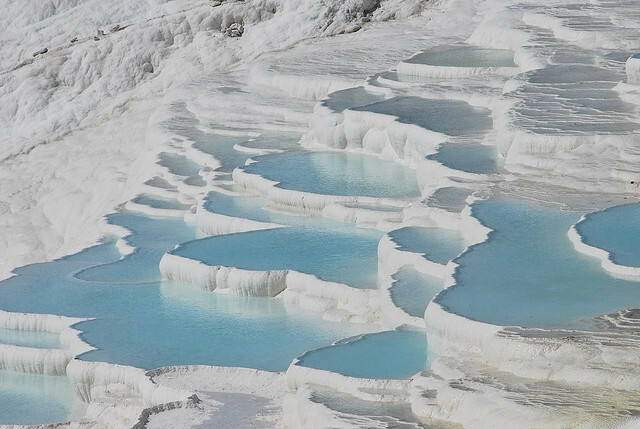 The travertines here have a concentric appearance and are almost sheer white giving the area an ethereal, other worldly appearance. 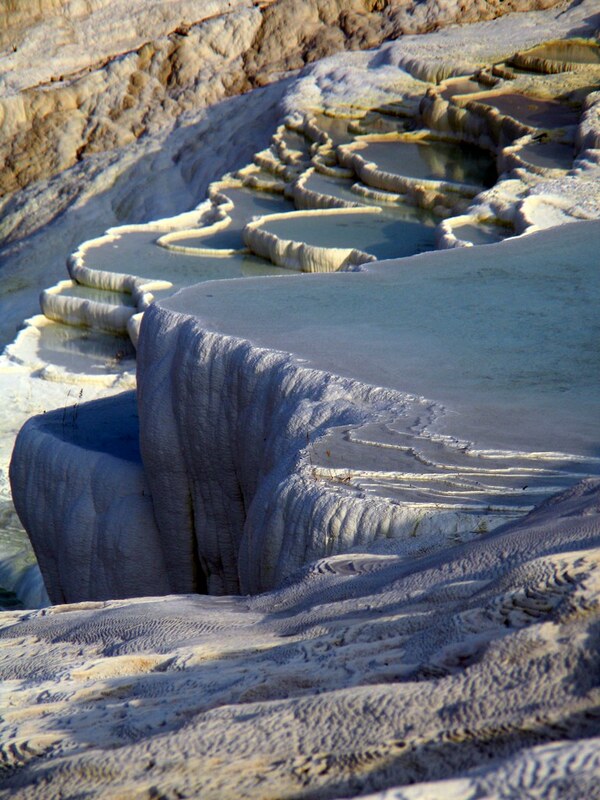 The hot springs precipitate calcium carbonate at their mouths and produce the strange almost organic looking structures. Before the area was declared a World Heritage Site it had its fair share of troubles. 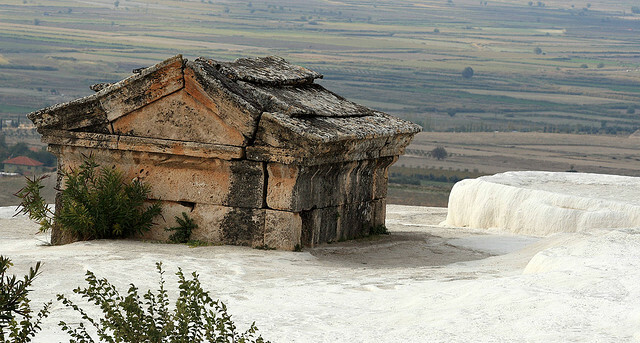 Vehicles were allowed up and down the hills and hotels were built on top of the remains of Hierapolis. Today the vehicles are prohibited and the hotels long since demolished, leaving the area to recover. 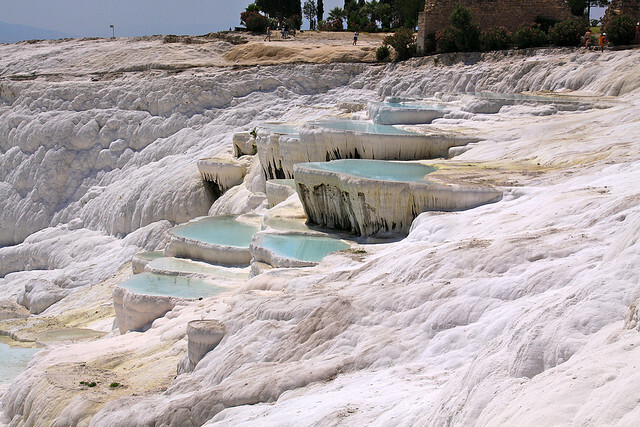 People are allowed to bathe in the travertine pools but are not allowed to wear shoes as these may damage the deposits. 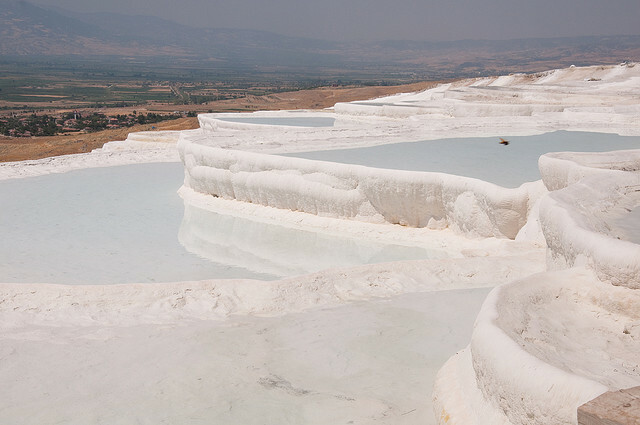 The travertine pools are at the top of a cliff which looks like, from a distance, that it is made from chalk or has been whitewashed by some giant Turkish Tom Sawyer doing his chores. 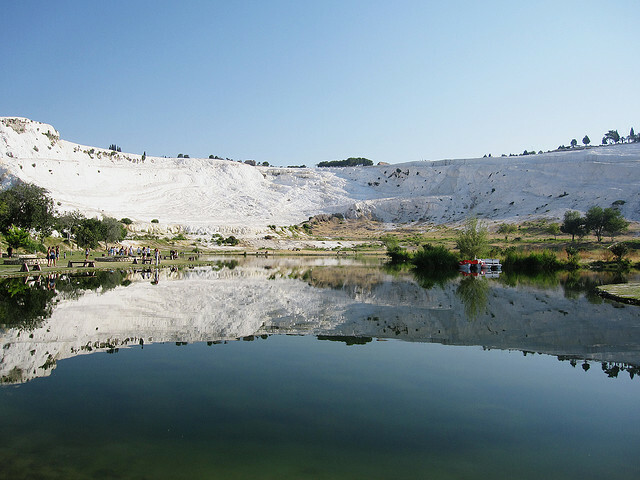 The site is home to not one but seventeen hot water springs which have varied temperatures from lukewarm to boiling hot. 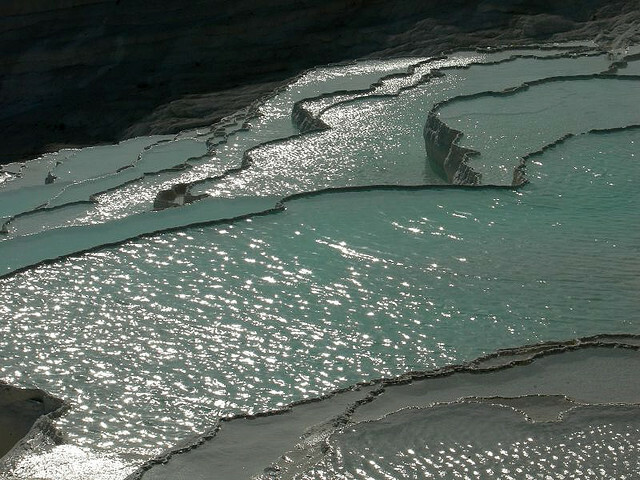 Transported over several hundred meters the water is then deposited in to the travertine terraces. 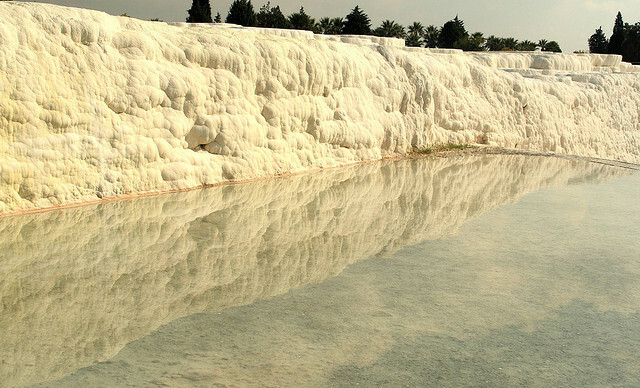 The calcium carbonate is first deposited as a soft jell which eventually hardens (hence the ban on footwear) and then becomes part of the structure of the travertine. 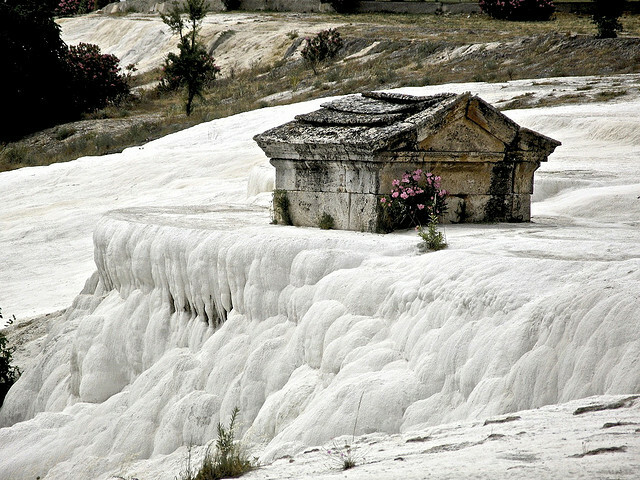 One of the more bizarre spectacles at Pamukkale is the site of ancient buildings which have been half buried by calcium carbonate deposits over the millennia. 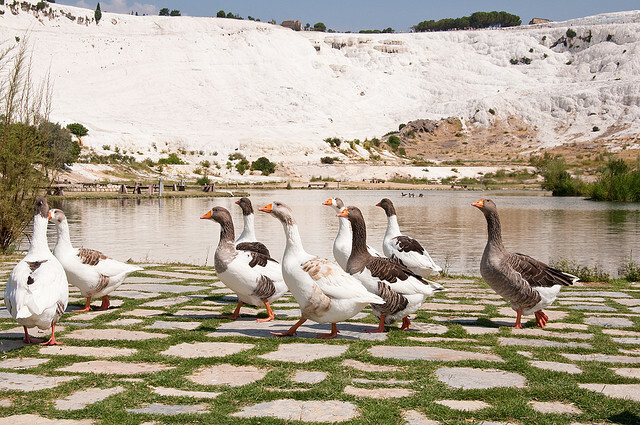 Hierapolis was a Greek speaking spa town, very popular with the wealthy of the ancient world for centuries. In fact the city was not fully abandoned until late in the fourteenth century. 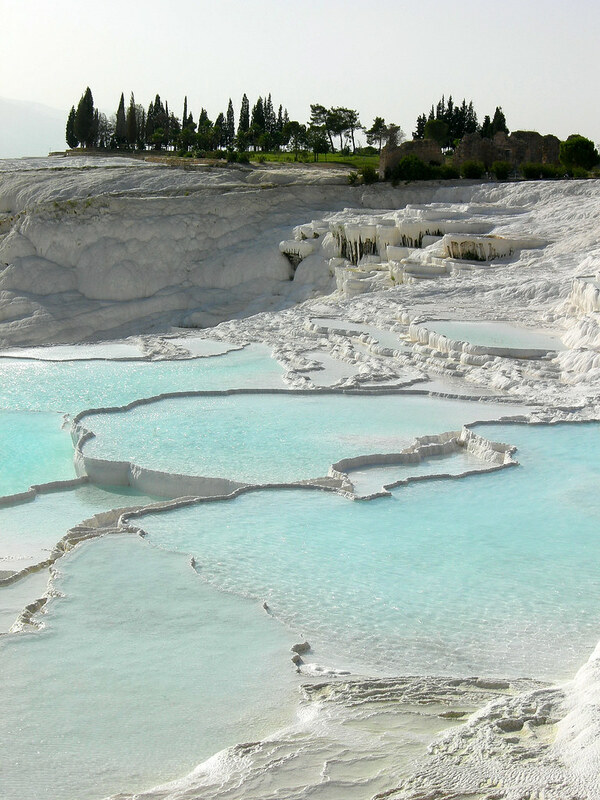 Although now abandoned as an inhabited city, Pamukkale receive many visitors each year to partake of the spring waters and for the almost blinding natural beauty of the place. 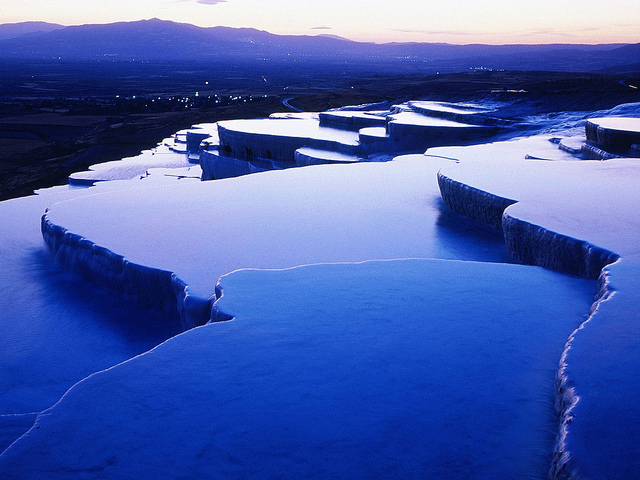 The travertines, formed as the water has cascaded over the cliff face of the site 12 miles north of Denizli, are really something special. 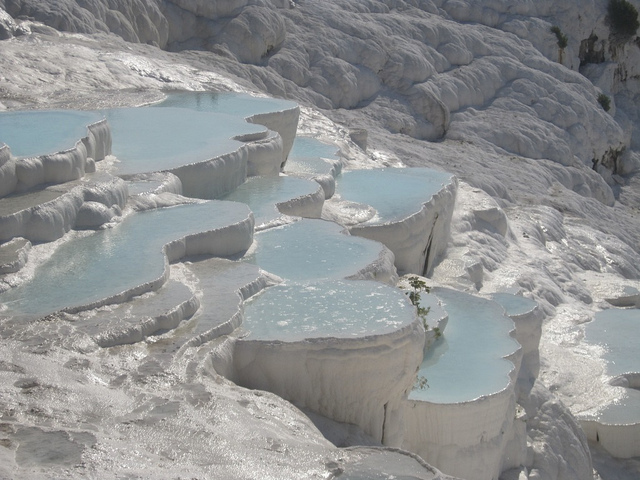 This place is extraordinary by virtue of its outstanding natural phenomena - balmy, profoundly mineralized water elegantly cascading from springs and creating pools and terraces which are visually spectacular. 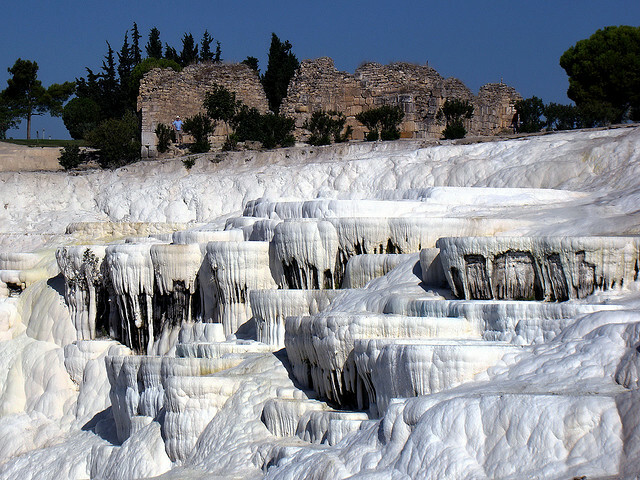 It is little wonder that Hierapolis, an extraordinary illustration of a Greco-Roman thermal installation, was founded. There is a local legend which to our ears does not sound terribly politically correct. A local girl was so ugly that no one wanted to marry her and she decided to commit suicide. 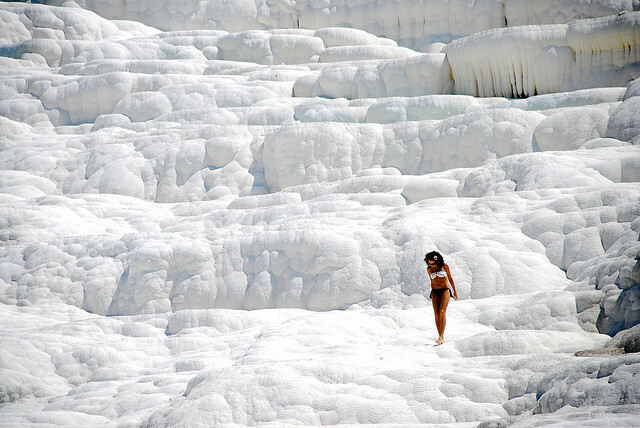 She threw herself in to one of the natural pools at Pamukkale and was transformed in to a ravishing beauty. Naturally a passing noble man decided to marry her and they lived happily ever after. No Shrek-like musings on the nature of beauty here. People still come in numbers to experience the curing effects of the water, which is said to help with high blood pressure, eye and skin diseases and circulation problems among many others. 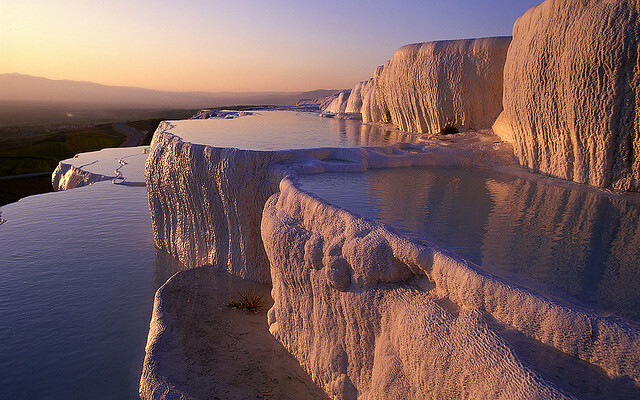 Yet for many it is simply the spectacle of the place which draws them to Pamukkale, the Cotton Castle.